THEODORE ROOSEVELT. Partial Autograph Draft of a Speech, June 17, 1912. 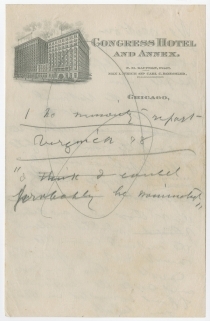 Front and back of a single sheet of imprinted Congress Hotel and Annex letterhead. 2 pp., 6 x 9½ in. We rest our case, not only before the Republican voters, but before the American people, upon the proposition, first, that the National Committee can not by fraudulent means defeat the wishes of the rank and file of the Republican voters by unseating delegates honestly elected & seated; and second, that those who are dishonestly placed substituted for them by the national committee must not be permitted to vote on their own cases and to be the beneficiaries of fraud committed in their own behalf. Republican Theodore Roosevelt had served as President of the United States from 1901 to 1909, and he helped ensure that his successor would be his Secretary of War William Howard Taft. While Roosevelt had become more progressive over the course of his presidency, President Taft took a more conservative direction. Progressive Republicans wanted a new candidate in 1912, and Roosevelt decided to seek a return to the presidency. This document is a draft of a part that appears about halfway through the speech. 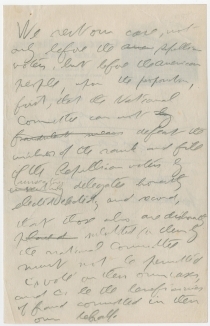 This speech was the first in which Roosevelt used the phrase, “we stand at Armageddon, and we battle for the Lord!” (Full Text of Theodore Roosevelt’s Speech, June 17, 1912). Roosevelt had won 9 of 13 Republican primaries. Taft won only two states, and Progressive reformer Robert M. La Follette Sr. won the other two. The total delegates from the states with primaries were 290 for Roosevelt, 124 for Taft, and 36 for La Follette. However, most states selected delegates in party conventions, where Taft’s supporters were stronger. As the Convention opened, no candidate had the 540 delegates necessary for nomination. Taft’s supporters won contests over seating delegates, and Roosevelt claimed that several delegations were seated fraudulently. In the final balloting, Taft received 561 votes, Roosevelt 107, and La Follette 41. In protest, 344 delegates, mostly Roosevelt supporters, abstained. Roosevelt then led in the creation of the Progressive Party. At their Convention in August, Roosevelt declared that “The nomination of Mr. Taft at Chicago was obtained only by defrauding the rank and file of the party of their right to express their choice; and such fraudulent action does not bind a single honest member of the party.” For a third party, the Progressive or “Bull Moose” Party performed well, but Republican divisions led to the election of Democrat Woodrow Wilson with only 41.8 percent of the popular vote. Roosevelt received 27.4 percent and William Howard Taft 23.2 percent. Roosevelt’s 88 electoral votes made him the most successful third-party candidate in American history, and this election was the only time in American history when the independent finished second in both popular and electoral votes and when the incumbent came in third. Theodore Roosevelt (1858-1919) was born in New York City and graduated from Harvard University in 1880 and attended Columbia Law School. He served in the New York State Assembly from 1882 to 1884, and as president of the New York City Police Commissioners in 1895 and 1896, then as Assistant Secretary of the Navy from 1897 to 1898. After service in Cuba during the Spanish-American War, he won election as Governor of New York and served from 1899 to 1900. He ran as Vice President to William McKinley in 1900 and became President in September 1901, when McKinley was assassinated. Reelected in 1904, Roosevelt was President until 1909. A prolific author and naturalist, Roosevelt was instrumental in the Progressive movement of the early twentieth century, helped preserve the nation’s natural resources, and extended American power throughout the world with a focus on a modern navy. In 1912, he again sought the Republican nomination for President, but when the convention chose incumbent William Howard Taft, Roosevelt formed the Progressive Party and outpolled Taft in the general election. The Republican division allowed Democrat Woodrow Wilson to win the presidency. On March 12, 1912, a state convention met in Virginia and selected delegates for Taft. Two months later, on May 16, Roosevelt supporters in Virginia met and named a separate set of delegates. At the convention, Roosevelt supporters contested the seats of 238 Taft delegates. On June 14, the Republican National Committee seated all 20 Taft delegates from Virginia. Virginia had a total of 24 delegates at the convention. In the convention vote, Taft received the votes of 22 Virginia delegates, 1 was absent, and 1 abstained.